Little T.Puzzle is obsessed with all things Thomas and he loves puzzles (hence the nickname T.Puzzle). You combine these two great loves of his and he has found nirvana. He has a Thomas and Friends puzzle that he puts together incessantly. If I so much as put the puzzle away so a floor can be cleaned, as soon as he can, he pulls it out and reassembles it. On the days he is home with me, he periodically informs me that he is going to take it apart and put it together again. 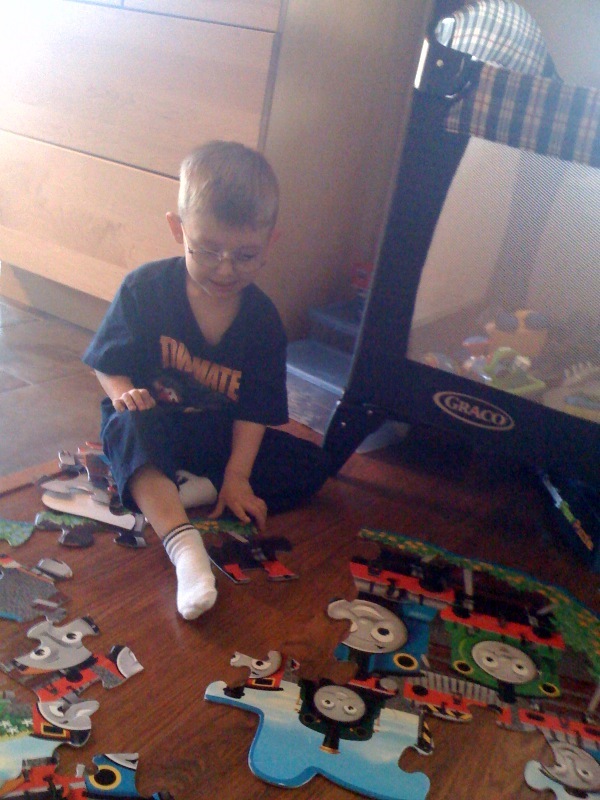 Not only is he single-minded in this Thomas puzzle obsession, he likes to pretend he is Thomas. I had to take him to the optician’s because his left glasses lens has two, distinct scratches. While we are waiting, I drew his name on an erasable board. He knows the letters of his name well enough to recognize it. So, I ask “What does that spell?” Instead of saying ‘T.Puzzle’, he says ‘Thomas’ and that makes an older couple in the corner laugh. They have a grandson equally enamored with the whole Thomas phenomenon. When it was time to leave, the Grandma leans over and says, “Bye, Thomas!”. Little T.Puzzle just looks at her like she lost her mind. “I not Thomas, I JAMES (which is a Thomas friend who happens to be red and the jacket he was wearing was red). So I took ‘James’ (who is apparently the most contrary of all the engines) home and guess what he did? His Thomas puzzle.